The Lenovo IdeaCentre K900 phone is a 5.5 inch full HD smartphone with a 2GHz dual-core Intel x86 processor. In our first test Smartlet makes a pretty good impression. 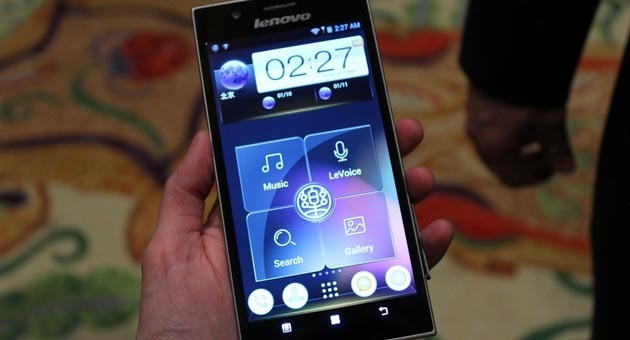 Lenovo has unveiled at CES a pretty interesting smartphone. The Lenovo IdeaCentre K900 phone comes with the new Intel 2GHz Dual Core Atom processor, which is optimized for smartphones. But the Lenovo is not only because of the x86 CPU so interesting, but also because of the 5.5 inch display. This has filled a Full HD resolution that is 5.5 inches so of 1920 × 1080 pixels. Unfortunately, would not or could not reveal all the details for Lenovo Idea Phone K900. But it is interesting in any case the camera, because this dissolves with 13 megapixels and has two flashing lights. In fact, these are the same camera, which can also be found in the Sony Xperia Z. The Lenovo IdeaCentre K900 Phone will be released within the next few months in China. A launch in Europe or the U.S., unfortunately, is not initially provided. That's pretty bad, because the Lenovo IdeaCentre K900 phone has made a pretty good impression. Especially the aluminum housing is very high quality and leaves little to be desired. This was however told that we try not pre-installed on the Idea Phone K900 Android 4.2 Jelly Bean could. At the latest at the Mobile World Congress in Barcelona we will see more smartphones equipped with an Intel processor. Previously dominated by ARM chipsets the smartphone and tablet market. Let's see if Intel x86 processors to catch up somehow.